Pictured on left (l-r) from Parkridge Health Care System are Robin Marsh, Tyler Bennett, Deborah Deal, and Tom Jackson; back row (l-r) are Anne Ervin, Dan Astleford, Michael Howard and Jared Lesher; center is County Mayor Jim Coppinger; on right (l-r) are HCEMS Captain Darlene Poole, Paramedic Crystal Johnson, and Patrice Shumerhorne; second row (l-r) are Lt. Bria Bricker, Lt. Brandy Rogers; third row (l-r) are Paramedic Leeh Butcher, Tracie Shannon, and HCEMS Deputy Chief John Combes. Employees of Hamilton County Emergency Medical Services wore pink shirts as part of the official HCEMS uniform during the month of October in recognition of, and to promote, breast cancer awareness month. This was the third and a record breaking year of selling the pink t-shirts, with all proceeds to benefit breast cancer awareness programs locally through the Sarah Cannon Cancer Center. 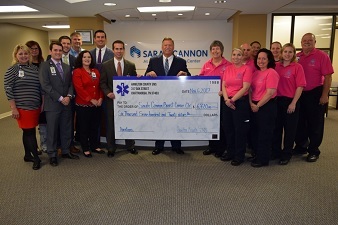 From the sale of over 1,300 shirts, HCEMS donated $6,720 to the Sarah Cannon Cancer Center to further assist those with breast cancer and their families, and to help in finding a cure for this disease. “I am again very pleased with the efforts and involvement of the Hamilton County Emergency Medical Services personnel. It was a record year for t-shirt sales during this annual event which promotes awareness of the disease in our community, the efforts being made to help find a cure and to support breast cancer survivors and their families,” said Darleen Poole, Hamilton County Emergency Medical Services captain.